Hey friends, how’s the week going? It’s been SO cold over here. Snowstorms, ice, and freezing weather make winter homesteading a little tricky these days. I’ve had a few people reach out asking about the logistics of running a homesteading throughout the winter months. Although I share pretty pictures of goats and chickens playing in a fresh coating of perfectly white snow over on Instagram, winter homesteading isn’t all that glamorous. 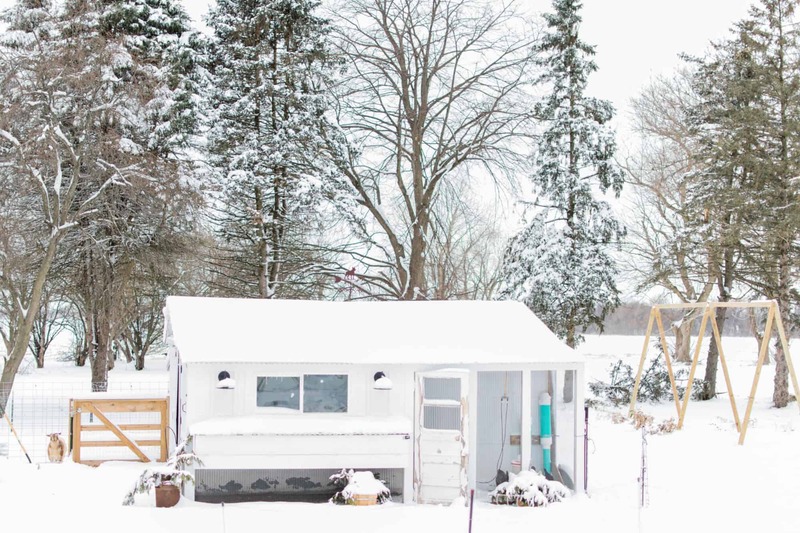 Want to know what winter homesteading is really like? Keep on reading for all the details. Remember those warm summer days when I could easily bring the kids out to the farm everyday? Yeah, winter homesteading makes that nearly impossible. Single digit temps, snow, and ice don’t create the most ideal situation for kid wrangling while finishing farm chores. A normal morning usually goes something like this: my stinker baby wakes up 7264829 times at night, so I sleep in until the last possible second. While Ben gets ready for work, I get the kids situated for the morning and then run out to the farm for AM chores. The cold temps literally make my face hurt, and I keep forgetting to buy appropriate gloves, so my hands feel like they’re going to fall off. See? Not so glamorous. When Ben gets home from work in the evening, he heads out to the farm for PM chores. So what do morning chores consist of? Seeing as we aren’t milking any of our goats (yet! ), chores are pretty quick and simple. The goats usually still have alfalfa hay, so all they typically need is a water refill. Depending on if it snowed (or if there’s goat poop) I’ll also shovel off their deck to make sure they have a clean and dry surface for the day. Easy peasy. I’ve received a ton of questions about how the chickens handle the cold weather. Before the weather gets too cold, the chickens will molt, or loose, their feathers in order to grow new feathers. These new feathers keep them warm throughout the cold winter months. Egg production decreases significantly over the winter months as well. Only 10 out of our 20 chickens are currently laying eggs (the others are still too young). We’ve been averaging 2-4 eggs per day, which is shocking high for this time of the year. Some people choose to add supplemental lighting to the coop to increase egg production over the winter, but we decided against this option. Chickens are born with a finite amount of eggs. Adding supplemental lighting doesn’t make them lay more eggs, it simply makes them lay eggs faster. No need to put extra stress on our girls, so we’re letting nature take it’s course in the egg department. 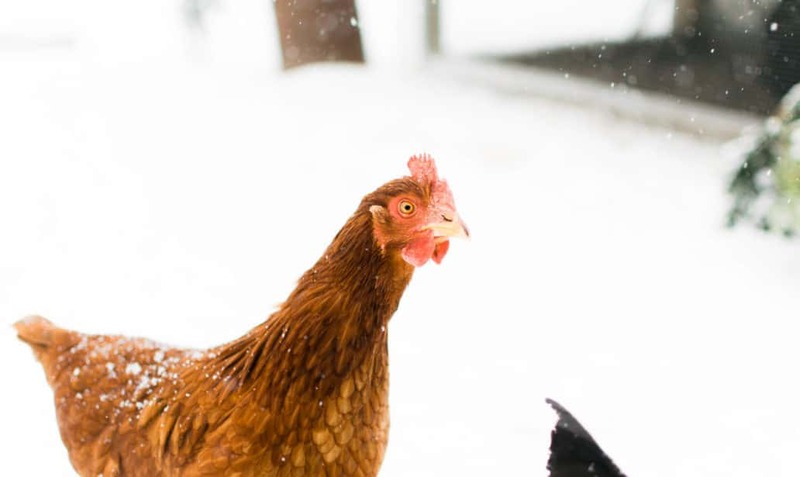 Although the cold weather doesn’t seem to bother the chickens, they definitely aren’t a huge fan of the snow. The chickens will happily roam around the farm if we have a light dusting of snow, but they choose to stay inside the run and/or coop if we get a few inches. Even though Nigerian Dwarf goats are originally from Africa, they adjust well to living in colder climates. Before the cold temperature hits, goats grow a cashmere under layer to keep them warm. Our goats get SO big and fluffy during the winter months. As spring gets closer, they’ll lose their cashmere coats in order to stay cool in the warmer months. In order to appropriately regulate their body temperature, it’s important for goats to stay dry. 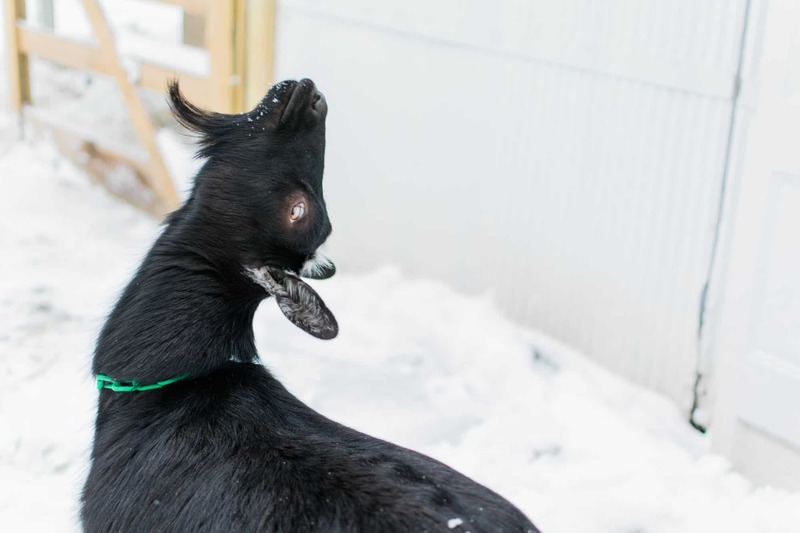 As a result, goats aren’t a huge fan of the snow. Under the lean-to area of the goat house, Ben built a deck. The deck allows the goats to stay outside when it’s cold and snowy while still staying nice and dry. The goat house is filled with clean, dry hay for bedding to keep the goats warm as well. Penny and Lucy usually snuggle up together at night (they feel SO warm when I touch their bellies in the morning), while Fran prefers to sleep solo. The biggest challenge associated with winter homesteading? Literally everything freezes. Water freezes (we use this heated bucket for the goats and this one for the chickens) and ice collects on the outside of the chicken feed and grit. The door on the nesting box freezes shut, so it’s nearly impossible to pry it open without slicing your hand. (Fun fact: I sliced my thumb in half opening a can a few years ago, and I’ve been traumatized ever since haha.) Even the eggs can freeze if they aren’t collected quickly enough. Luckily, we have one broody chicken that sits on the eggs all day, so they’re usually toasty warm. And that’s it! Although I’m trying to appreciate these slower winter homesteading months, I’m already feeling very excited for the spring. 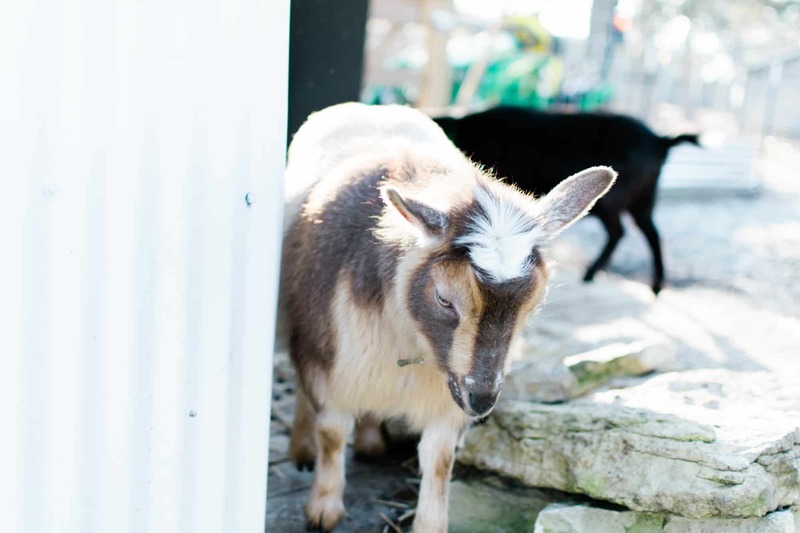 Baby goats and garden prep – there’s so much to look forward to!